Andy Nelson, who took over as Kitsap County’s public works director two years ago, quickly proved his worth to the local environment when he proposed federal funding for three major ecosystem-restoration efforts. One project begins with a proposed $350,000 study of South Kitsap’s Burley Creek watershed — an important stream that probably has never received the attention it deserves. The other projects are in Silverdale and Hansville. How did a relatively small Kitsap project find its way into a massive public works bill? You could say it was because Andy was aware of a congressional effort to seek out local partnerships with the Army Corps of Engineers. That effort, which began in 2014, came about in part as response to the elimination of old-fashioned earmarks, by which members of Congress could promote their favorite local projects. In fact, there were no projects in Kitsap County proposed in partnership with the Army Corps. 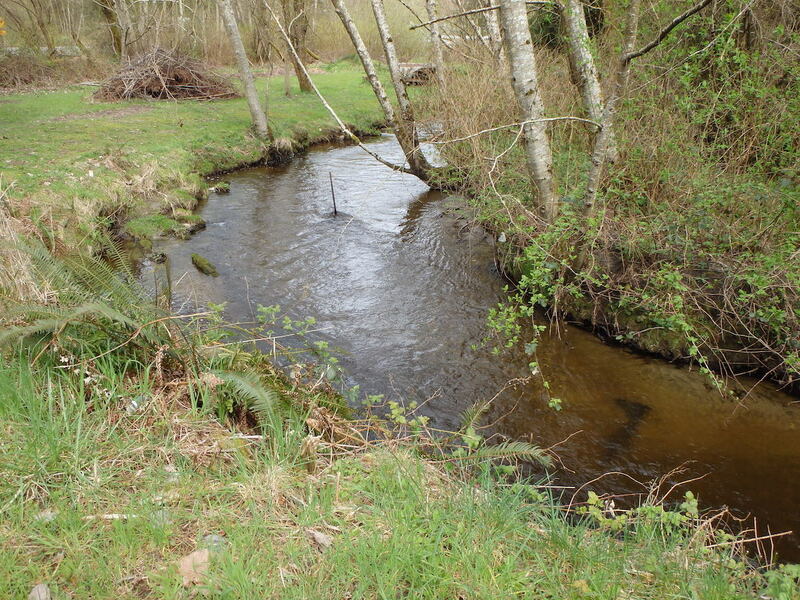 The Corps had previously done studies on Harper Estuary in South Kitsap and on Carpenter Creek in North Kitsap, but funding was never available for the actual restoration work. Andy put his head together with staffers in Kitsap County Public Works (his department) and the Department of Community Development. They came up with three projects to be submitted to the Corps for consideration. In the end — and to Andy’s great surprise — these three Kitsap projects were the only ones submitted from Washington state during the first year of the solicitation. The Burley Creek project is one that Tim Beachy, an engineer for Kitsap County Public Works, had been considering in a more limited way. 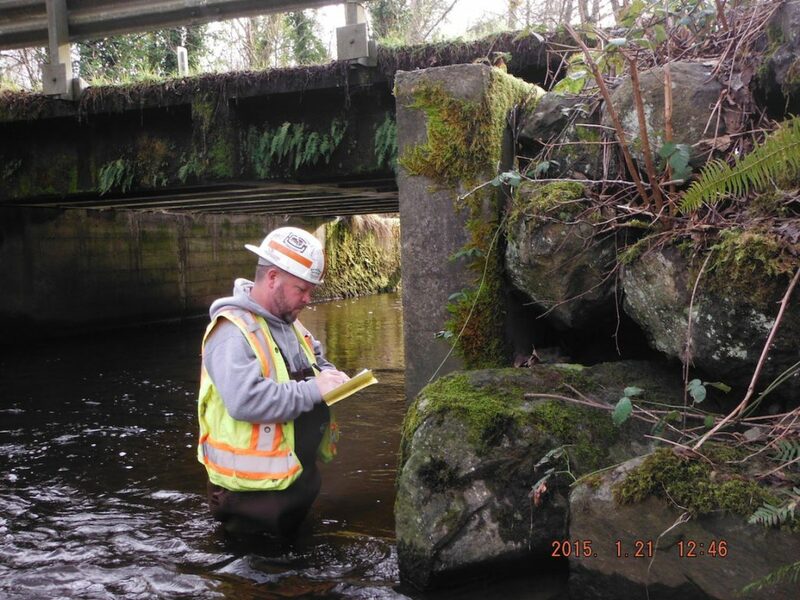 Dan Wolfe of Kitsap County Public Works conducts an annual inspection of the Spruce Road Bridge over Burley Creek. A barrier culvert is one identified as blocking or impeding the passage of salmon. Replacing a culvert can alter the grade of the stream channel, affecting bridges and culverts upstream and/or downstream and potentially leading to unanticipated consequences for salmon migration. It turns out that Burley Creek contains spawning beds used by Puget Sound chinook and Puget Sound steelhead, both listed as threatened under the Endangered Species Act. It also contains important spawning and rearing habitat for other salmon species. At Andy’s direction, a study was proposed to look at salmon passage at four bridges in close proximity on Burley Creek, to consider the effects of flooding and storm damage on the roads and bridges, and to propose further actions that might reduce pollution affecting shellfish downstream in Burley Lagoon. County officials met with the Corps to discuss the idea. The Corps accepted it as a worthwhile project and proposed it for funding. Congress will have the final word on the study, which would be done by the Corps. If the project moves to construction, local and state funding — probably a 35 percent match — would be needed. The Burley Creek study requires congressional authorization because it is somewhat unique and does not fit under the “continuing authority” that allows the Corps to investigate issues such as shoreline restoration, shoreline stabilization, ecosystem restoration or navigation, Andy told me. The Corps does not have authority to address water-quality projects per se. The other two projects are still being evaluated, but they will not need congressional approval since they fall under existing authority of the Corps. One would be a close look at Silverdale’s waterfront at the head of Dyes Inlet, including Clear Creek and the pocket estuary near Hop Jack’s and Silverdale Beach Hotel. The study would look at ways to restore ecological processes and biological diversity, including shorelines used by forage fish, salmon, resident and migratory waterfowl, and diverse species found in both freshwater and tidal marshes. The project would address stormwater alternatives and consider ways to improve passive recreation. The last project — which was actually the first in a letter to the Corps — would involve the restoration of freshwater and saltwater marsh habitats in and around Point No Point County Park. The study would look at the longterm effects of sea-level rise, including flood control and potential damage to houses, roads, park facilities and the historic Point No Point Lighthouse. The project could create a more natural setting and enhance intertidal connectivity.